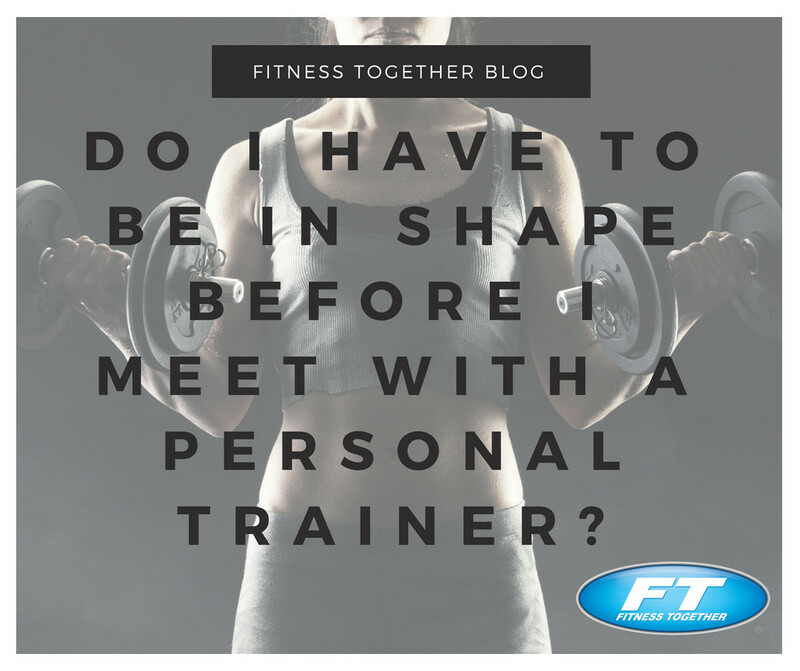 Do I Have to Be in Shape Before I Meet With a Personal Trainer? We know what you’re thinking. You’ll start working with one of Fitness Together’s trainers once you lose that stubborn 10 pounds. Or once you get in better shape. Or once you have more time. You’ll come to us someday, right? Well, if this “someday” is like anything else on your someday list, there’s a decent chance we’ll never see you, with our without those 10 pounds. We’re not trying to be harsh, but most people could appropriately call their someday items, “ain’t never gonna happen” items. Tony Robbins drove this point home when he said, “The road to someday leads to a town of nowhere.” We can get stuck in the idea that our ambitions have to wait until some arbitrary other goals are met. And when we enter this cycle, the end result is too often frustration at goals not met. So instead of leaving your goal of getting fit in the fuzzy realm of “maybe someday after I finish this bag of chocolate mint cookies” we have a few things to share about the benefits of starting a workout routine TODAY, and some ways to get started. As in, for real. You’ve got nothing to lose, and a whole lot to gain. Sure, a defined abdomen or enviable biceps may be a few months away, but that doesn’t mean that you don’t have benefits to enjoy by starting to exercise now. Work out today, and you’ll almost immediately enjoy greater quality sleep, an improved self-esteem, and a healthy mood boost.doesn’t mean that you don’t have benefits to enjoy by starting to exercise now. Work out today, and you’ll almost immediately enjoy greater quality sleep, an improved self-esteem, and a healthy mood boost. Start tracking. Right now: weigh yourself, take a few minimal-clothing selfies, tape-measure your waist, thighs, and arms and write down the numbers along with today’s date. Seeing yourself make progress, no matter how small, provides motivation like little else can. Focus on things besides exercise, too. Today: write down 5 things that you are going to do to be healthier. It could be that you’re going to drink 9 glasses of water. Or you’re going to can the soda, take the stairs at work, choose a side salad over the fries, or any of the hundred other choices you make on a daily basis. Pick 5 things every day (either the same 5 every day, or else you can change it up a bit), and you’ll be pleasantly surprised at the positive snowball effect it can have in helping you develop some permanent healthy habits. After all, good choices breed more good choices, just like bad choices tend to perpetuate more bad choices. Be a planner. Good habits don’t start by accident. Want to take a brisk walk at work? Pack your athletic shoes. Want to work with one of our trainers? Call us up and make a few appointments. Want to cram more produce into your diet? Wash and cut those beautiful veggies and store ‘em in single-serving containers for a too-easy-to-ignore grab-and-go. To be honest, we’d rather see you in a come-as-you-are fashion, rather than a souped-up you after you’ve waited far for too long to come in. We’re happy to meet you exactly where you are, today. Right now. And then, we’ll be thrilled to watch just how far you can go.